Hi! I wanted to share the rosemary roasted nuts I posted on the Better Homes and Gardens’ blog last week. A little bit salty, spicy and sweet, these herbed nuts are proof that sometimes a little bit of butter and sugar go a long way. I should warn you: these nuts are absolutely irresistible. Speaking of last week, the past several days were a total whirlwind, in the best possible way. I traveled to Salt Lake City for a blog conference called Alt Summit. I’m so glad Melissa, Erin and Heidi peer pressured me into buying a ticket, because I had a grand time hanging out with with them and Kelsey, Jeanine, Maria, Liren and Becky. Quite the talented bunch, no? Highlights included sitting down for a chat with Jessica Alba (proof! ), actress and founder of The Honest Company, a natural, eco-friendly product line. Many thanks to Heidi for offering me a place to stay, and by “place to stay” I mean a bedroom in her gorgeous mountain-side home with enviable marble countertops and three sweet pups (meet Gigi). You all missed out on some seriously incredible butternut squash lasagna with shiitake mushrooms that she made for all of us. I could ramble on forever but I have a work deadline to meet. I’ll be back soon with some killer quick bread, and maybe that granola recipe I owe you, and then expect a bunch of hearty soups and salads because my jeans are too dang tight. Until then! These party nuts are a little spicy, sweet and herbed. You can’t go wrong with these! Recipe yields 5 ½ cups. Preheat oven to 350 degrees Fahrenheit. 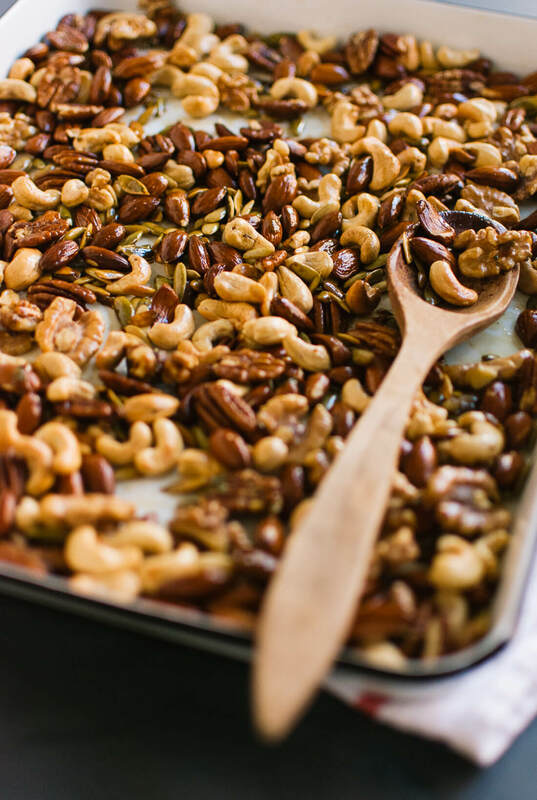 On a rimmed baking sheet (if you’d like, line it with parchment paper for easier cleanup), mix together all of the nuts. Bake about 12 minutes or until fragrant and toasted, stirring halfway. In a small bowl, combine the chopped rosemary, brown sugar, salt, and cayenne pepper. Stir in the melted butter. Drizzle butter mixture over nuts, tossing gently to coat. Sprinkle with salt to taste. Serve warm or cooled to room temperature. Store in an airtight container for up to 3 days. 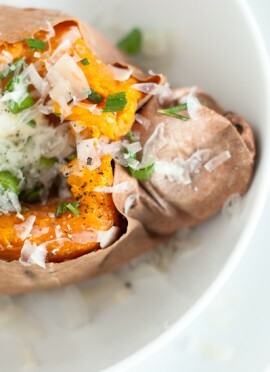 Recipe minimally adapted from BHG’s rosemary roasted nuts, for their Delish Dish blog. I’m allergic to nuts, but am guessing these would also be great with just seeds. So wonderful to see you at Alt, and I hope our paths cross again very soon! Hi Elizabeth! Running into you at Alt was such a treat. Hope to see you again soon, too. 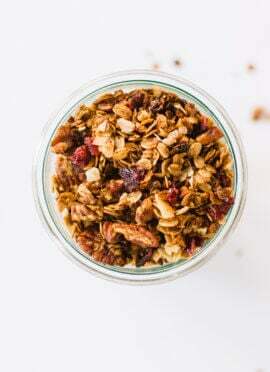 The pepitas in this mix just might have been my favorite, so I bet you would love this spice mixture on roasted seeds! I’m so glad we got to meet up, but totally bummed we didn’t get to visit more. Keep in touch! Likewise, Carrian! It was lovely to meet you. Talk soon! Thanks, Maria! It was so, so nice to meet you in person. Hope to see you again soon! Say hello to Caleb and Josh for me, please. Those nuts, those nuts, look deevine. Why didn’t we make some of those to snack on along with all that dang cheese? Had such a great time with you this week, with the late night chats and early am wake up calls and sharing your tricks and tips. You’re so glad you left when you did, the airport shut down and we had 10 inches of snow! Oh my, I’m glad I got out in time! They did have to de-ice the plane before we left, but it was kind of fun to watch them spray down the wings in neon colors. Thanks again for hosting me. I owe you big time. Sounds like you had a fantastic time at Alt! And those nuts — my WORD they look yummy. Oh, those nuts. I’m guessing they would be gobbled up at any party. It was such a pleasure to meet you this past weekend! Rosemary is one of my favorite herbs, these would make such a great appetizer! Those nuts look great Kate! I love the first photo. I’d never heard of the Alt Summit before (maybe I live under a rock and didn’t realize it) but it sounds like a fantastic conference! I’ve wanted to go to a blogger conference ever since I started my blog but haven’t had a chance yet. Maybe that will be my first! Thanks, Angela! Alt Summit is geared more towards design/fashion bloggers, so that’s probably why you haven’t heard it in food blog land. :) I might go to BlogHer Food this summer. If I do, I hope to see you there! Oh my seriousness, ohhhh my gosh. Yes. Sounds like a fun and fruitful trip with so many great people! Good for you for letting the peer pressure get to you and buying a ticket. You are one busy woman! I am busy, aren’t I? But so are you! Can’t wait to see your beautiful, finished cookbook, Erin. Fabulous flavors! Now, take half the batch and spin it into nut butter then put it on everrrything. You won’t be sorry. :) Sounds like you had a great time at Alt! Ooh, good idea, Ashley! I just got a fancy new blender. Spiced nut butter, here I come! I’m a new food blogger and wanted to ask what food blogger conferences you could recommend. The one in Utah sounded interesting. Good question, Kurt. Alt was my first blogger conference and it was more geared towards lifestyle/fashion/design blogs than food. If I go to another one, I might go to BlogHer Food in Austin this summer (that seems to be a popular one). So awesome that you got to meet Jessica Alba! That is so cool. And, these roasted nuts sound truly delicious! Thanks for the roasted nuts recipe! 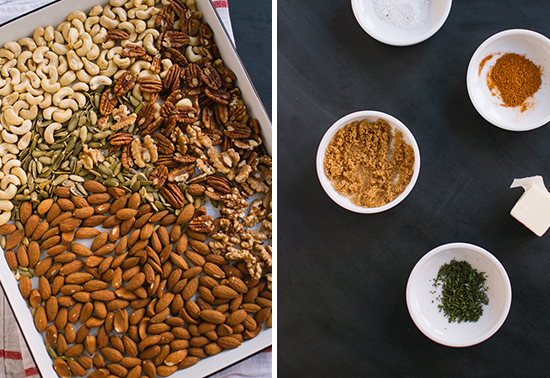 I buy the mixed nuts at Costco – unsalted – and this looks like a great way to jazz them up! Sounds like you had an amazing time and those rosemary nuts are just my kind of snack. 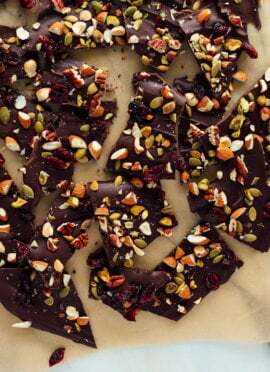 I made these for my husband as a Christmas gift and he says it is the best nutmix he has ever had. Thanks for another great recipe! That’s so nice to hear. Thank you, R.A., and happy New Year to you both!